Nice surprise to find myself on the back cover of this months Classic & Sportcar magazine, in a full page advert for EFG Private Bank which features me driving Stefan Ziegler's glorious D-Type Jaguar at last year's Le Mans Classic. It occurred to me that this is yet another good example of EFG's impressive approach to sponsorship activation. They take a long term view: despite their main goal being to network and secure new customers from the lucrative historic racing paddocks, they don't 'ram' their sales message down participants' throats. Instead prefer to quietly nurture personal relationships, over multiple years if necessary, by supporting the hobby that their target clients are so passionate about. They do this by sponsoring the series to pay for tangible, 'feel-good', items such as trophies, nice hospitality and catering, welcome events and parties. Eventually, these social functions fuel a trusting relationship between EFG's representatives and their target customers - the participants and car owners, who soon welcome a 'business chat' in the informal surroundings of the race paddock. EFG's activation of the sponsorship is also bang on. Private banks vary in their levels of brand recognition and EFG recognise that what matters is to become known only by their target market. Therefore focused advertising in classic car publications - be that established national magazines such as Classic & Sportscar, or the informal race series newsletters - is an efficient way of building the brand to the people that count. If more companies followed EFG's example of playing the 'long game', and apportioned sufficient additional budgets for real activation of their sponsorships, they'd realise that motorsport sponsorship can - and should in fact - be a profitable activity. In an earlier post, I suggested that most motorsport sponsorship deals these days have a 'business-to-business' element to them and promised that I'd flesh this idea out further for those who may be new to the concept. If you race in anything other than F1 or NASCAR and still cling to the thoery that your high-speed billboard is worth a cheque with several zeros on the end, forget it - those days are long gone (unless you are very lucky). In these times of accountability and massive budget cuts, only one thing talks and that's profit. In fact, even in F1 and NASCAR, I'd hazard a guess that many of the heavily branded sponsorships actually have a B2B element behind them that offers the accountable marketing director a clear and measurable justification for signing the cheque. B2B sponsorship deals are where you, as a team or driver, can introduce new business to a company - that without you they would not have access to - in exchange for sponsorship money. Critically, the potential profit that the company would expect to make from this introduction should be more that the sponsorship fee. Thus making it a profitable activity to sponsor you. At the very least, it should match the fee so that the sponsorship is percieved to be 'zero cost'. Company A should ideally be a close contact, with whom you have a warm relationship, and is keen to see you succeed. So long as it doesn't cost them any money, they'll do whatever they can to help. Company B would love to win the business of Company A, but doesn't have a good contact there and, anyway, Company A is already happily in bed with a rival supplier. Your job is to go to Company B and explain to them that, if they sponsor you, not only do they get all the traditional sponsorship benefits, but also a warm introduction to the top dog at Company A who would seriously consider giving them his/her business if it entices them to sign a sponsorship cheque. Company B wins a big new client that they wouldn't have had without you and, although they have to write a big, fat sponsorship cheque, they'll still make a profit AND enjoy all the perks of being a sponsor. You get to go racing! So, the reality is that to Company B, the sponsorship benefits of branding, hospitality etc. are really just perks - they don't need them (they may not even care about them), but they're nice to have as the icing on the cake of an already profitable introduction. This was very much the case behind our partnership (I actually don't think the word sponsorship is quite so appropriate for this type of deal, particularly with companies so scared of the 'S-word' these days) with Hiscox insurance brokers on last year's Jota Aston GT2 car. In the beginning Hiscox really didn't care about the branding/association/hospitality rights etc. All that mattered was the introduction of new business which we were able to facilitate for them but, as you can see from the photo above, once their marketing team were alerted to the rights they now had access to, they really went to town on leveraging the association! This is a great example of a happy B2B marriage that is set to continue in the coming years. Who do you know that is a decision maker in a business and is keen to see you succeed? Who can you pair them up with that would love to win their business? Can you do more to facilitate business introductions between your existing contacts? 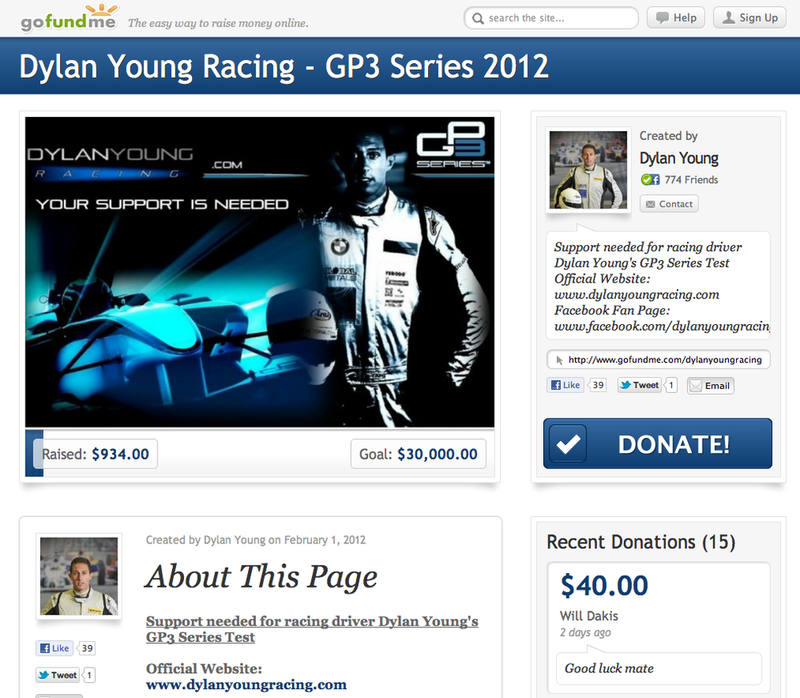 Just had an interesting chat with my brother, Ollie Hancock, who's noticed an increasing number of young drivers using the GoFundMe platform to raise sponsorship these days. I've taken a look and I've gotta say, I just don't get it. Sponsorship pleas like this one are commendable in their intent, but flawed in the execution due to the vast sums of money required to to go motor racing. It's all very well saying that every penny counts, but why lean hard on friends, family and other contacts for fifty quid here and there that ultimately isn't gonna come close to getting you on the grid? These kind donors all give willingly and want to see you suceed, but they've worked hard to earn that money and you'll be indebted to each and every one of them just as much as one 'real' sponsor signing a company cheque for tens or even hundreds of thousands of pounds. The work load in managing, thanking, nuturing and communicating with this vast number of micro-sponsors is at least equal to - if not greater than - that required to find and look after those one or two major backers. I'm no guru in this area, but I have been raising sponsorship since I was 16-years old that ultimately funded my early career and created the springboard for me to eventually turn pro. I'm wildly grateful and lucky to have been supported over the years by both private patrons, local small businesses and global corporations alike who in total provided over £1m of funding needed to fuel my early career. I used every concept in the book, from a simple 'picnic in the paddock with Sam Hancock' for £200 per head, to a formal public offering of shares in my future that would have seen me listed on the OFEX stock exchange (had it worked!). I definitely didn't get it right every time and a few of them fled for the hills at the first opportunity, but I was learning on the job and, for the most part, I know that most considered their support very good value. The reason for this? I never begged and I never tried to sell a moving billboard. The sponsor always got something back in exchange, whether it be feel-good factor (private patron supporting a young talent), private driver coaching, track days, hospitality, promotional appearances and yes, eventually, branding and exposure... but frankly the latter is ALWAYS just the icing on the cake as far as the sponsor is concerned (unless you're in F1, Nascar etc). The game has evolved further still in recent years as the world has become poorer and the costs have continued to spiral - these days just about all major sponsorships (even those in F1) have a significant business-to-business element to them which, if well structured, should see the sponsor actually profiting financially from their involvement! We'll look more at this in future posts, but in the meantime remember: a good deal is one where both parties genuinely win out of the arrangement, and would be willing to do it again once the deal has run it's course. Are your sponsors winning out of the deal just as much as you? What can you offer that has a tangible, measurable value? Or are you guilty of begging?! You may have seen this already, but I love this Audi ad - it's fantastic to see major car manufacturers working Le Mans into their global marketing campaigns. And a nice dose of inspiration as a driver also.